Have you heard of the power of creative visualization? It really is awesome. It's applications are limited only by the imagination. In other words, it can probably find a place in just about any health promoting or disease treating process. In practice, the real limit comes down to finding someone who understands the usefulness and knows how to apply the process. It certainly doesn't suit everything or everyone all the time. But it has its place. If you have the knowledge or a skilled guide creative visualization can be an extremely powerful tool for supporting inner cleansing. But I guess you already know that or you wouldn't be here. In a session you relax both body and mind as you explore your inner universe on a guided creative visualization. You stay very much connected to your outer world too. This is enjoyable therapy, not 'tripping out'. In a wonderful half-hour session you can discover and apply the massive cleansing and healing capacity that nature provides. Enjoy the multiple health benefits associated with harnessing the immense power you possess in your own creative imagination to direct healthful change within. Your mind is extremely powerful and has an astonishing capacity to effect change within your body. Creative visualization is an established way to speed detoxification and promote healing. In this expertly conducted session Dr Peter Tylee draws not just on his PhD in psychology but on decades of broader clinical experience dealing with diverse health problems. 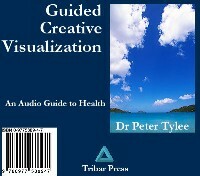 As a skilled guide Peter will facilitate your own creative visualization to maximize benefits and eliminate risks. Creative visualization for inner cleansing and healing allows the direct application of the mind's power to general and specific physical needs. This may be to enhance functions, encourage and accelerate toxin elimination, or direct specific healing attention to known health problems. Peter's approach is sensitive to the view that a problem focused upon is one that is energized. Hence, his method involves broadly enhancing natural healing abilities rather than narrowly focusing on any single or particular problems. This makes the session invaluable for general inner cleansing and applicable to any other specific issues, without there being any need to name them. With this audio program you will have the convenience of a therapy session on demand at times and places to suit your needs and circumstances. Do you want to enjoy enhanced wellness and discover how to maximize your natural cleansing and healing functions? * Price available today. Tribar Press reserves the right to increase the price at any time. Naturally, your satisfaction is fully guaranteed. You risk nothing by purchasing from Tribar Press. You will be able to download the session in MP3 format and copy it to your MP3 player or write it to a CD for your CD player. Set it up to maximize your own convenience. This excellent program, complete with brief written safety notes from Peter, can be delivered to you within minutes by online delivery immediately after payment. Start enjoying a naturally healthier life today. Order now, via the link below. Discover just how powerful visualization can be.